Come fall, Nebraska is home to some of the best fruit and vegetable harvests in the Midwest—as well as some of the best u-pick farms! As the weather cools down, visiting apple orchards is a fun way to promote healthy living and spend some time outdoors before the winter arrives. So grab some friends or family members and head out to one of these best apple picking spots in Nebraska. Kimmel Orchard & Vineyard in Nebraska City offers more than 40 acres of u-pick crops and the opportunity to pick your own apples. Explore the orchard where apples have been grown for over 90 years, and leave with the fruits of your labors. 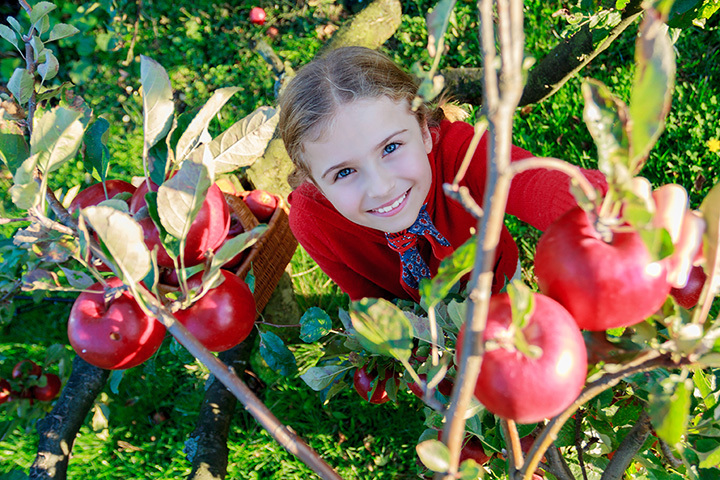 Explore an orchard of 3,000-plus dwarf apple trees at Trees, Shrubs, & More in Bellevue. A smaller variety of apple, dwarf apples are still mouthwatering and full of flavor. Apple picking starts in mid-August and ends when they’re all gone! Head to Hillside Orchard in Ceresco for a variety of apples to pick. From Honeycrisp and Jonathan apples to Sonata and Fuji, Hillside has something for everyone. Picking bags are provided so all you have to do is show up! As the weather cools, the Arbor Day Farm in Nebraska City goes into full swing. Experience the excitement of apple picking in the orchard and fill up on apples by the bag or bushel! Degroot Orchards is a family-owned orchard that has been operating for over four generations. With over 40 acres of trees and 22 varieties of apple, you can pick a range of delicious apples to take home and enjoy. Nestled in the heart of Nebraska’s apple country, Union Orchard transforms in the fall into what feels like miles of farm fresh apples. The orchard offers 18 varieties of crisp apples to choose from.